Guitars and singing go together like cookies and milk or popcorn and movies…one of life’s many classic pairs. There’s no better way to compliment guitar music than with melodic voices and captivating lyrics. Take any well-known vocalist, and chances are they also play the guitar or vice versa. While mastering one musical skill is impressive enough, those who know how to both sing and play the guitar are exceptionally talented. Although Taylor Swift and Jack Johnson make it look easy, the truth is it’s not. But, not to worry—singing and playing the guitar is something that can be learned and perfected with time. So, stop listening to that voice in your head that says you must be one or the other. We’re here to tell you it’s possible to be both an awesome guitar player and a stand-out vocalist! Want to know how? 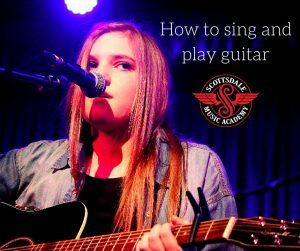 Follow the tips below to get started,and who knows…maybe one day you’ll be performing on stage for local Phoenix and Scottsdale fans as both a guitarist and a singer! To be both a singer and a guitar player, you need to know the basics of each. The best way to learn those skills and build a strong foundation in both disciplines is by following the advice of pros and soaking in all they can teach you. What better way to do that than by taking music lessons taught by real musicians who know just what it takes to learn more than one musical craft? 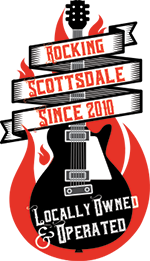 At Scottsdale Music Academy, we offer guitar lessons, vocal lessons, and lessons for just about every other musical instrument you can think of. We can help you get your voice in singing shape and teach you all the guitar riffs known to man. Whether you choose to take music lessons with us or not, it is important to learn the essentials of your craft in order to perform effortlessly and play music worth listening to. Playing the guitar and singing simultaneously is a bit like trying to pat your head and rub your belly at the same time. Doing two things at once is tricky no matter what they are, but it is especially tough to coordinate hand movements on the guitar with various changes of voice. To make learning this new skill as frustration free as can be, you should pick an easy song to start with. Choose a song that has a simple melody, few chord changes, and one that is already familiar to you. This will give you the best shot at conquering both musical parts. Once performing the song becomes a breeze, you can move on to more challenging songs. Start slow and easy, stick with it, and soon you’ll be able to sing and play the guitar without having to put any extra thought into it. When first learning how to sing and play guitar at once, it can be helpful to listen to a recording of a particular song to get a feel for the nuances of it. Hearing how the song should ideally sound will give you the understanding you need to tackle the song yourself. Our advice is to first focus on your voice and the lyrics. Make sure you can reach the notes and be sure to practice the lyrics until you know them by heart. Then, try breaking the song into smaller parts and listening to a measure at a time. When you feel confident enough, gradually begin to play along with the recording little by little. Before you know it, you won’t be able to tell a difference between the recording and your own playing! Although learning how to sing and play the guitar at the same time might seem daunting, remember that anything worthwhile takes time and practice. Don’t get discouraged if it doesn’t come naturally to you right away. Trust us when we say that it doesn’t come naturally to most people! The good news is you can develop the necessary skills to be gifted at both disciplines. And if you need help getting to that point, let Scottsdale Music Academy guide the way. 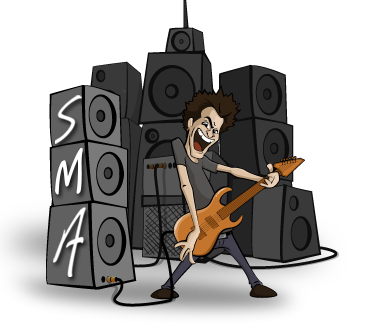 From coaching you on the guitar to helping you prep your voice for the stage, Scottsdale Music Academy is the one-stop destination for all your musical needs!